In February, Lady Gaga was forced to cancel the remaining portion of her Born This Way Ball tour, due to a "labra tear of the right hip caused by strenuous repetitive movements." She also said she had synovitis, a severe inflammation of joints. Gaga had surgery on February 20 and will need to take it easy for a while. Now, as the New York Post gleefully and exclusively reports, the injured pop star commissioned a one-of-a-kind wheelchair, so that she may recover stylishly. It's designed by Ken Borochov of Mordekai — a luxury jewelry/metalwork company responsible for some of the gorgeous crowns and claws Gaga has worn. Terry Richardson took a picture of Gaga in the chair and posted it on his blog; it's also posted on Lady Gaga's social network, LittleMonsters.com. Check out another image here. Gaga called me and said she wanted to be in a wheelchair. She wanted me to design it and not the prop department. 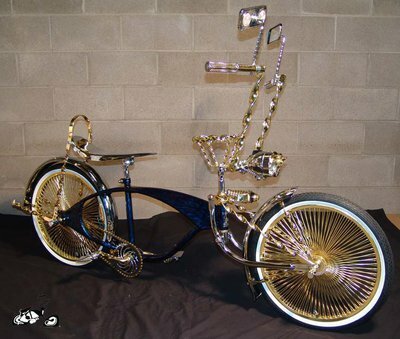 I took it upon myself to drive to East L.A. and exchange the wheels for some low rider ones. I ordered some Gucci fabric and handed it over to my genius friend/designer Michael Schmidt so he could embellish it with Swarovski crystals. Originally, we made a metal logo that read "Gaga" on the wheels, but she disliked the font and we ended up exchanging it for the Chanel logo. "I certainly wasn't expecting that phone call and have never done a wheelchair but am always up for a challenge and was thrilled to create what I affectionately dubbed the Chariot, a chair fit only for a queen."